Boba Fett is just a ghost in the wind. Sensational Star Wars: The Empire Strikes Back-inspired artwork! Limited edition of just 150 pieces! The paper giclee print measures 22-inches wide x 17-inches tall. This sensational Star Wars: The Empire Strikes Back-inspired artwork features bounty hunter Boba Fett in action. 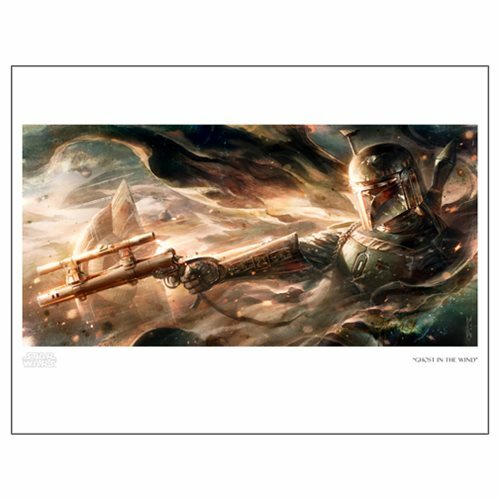 A hand-numbered limited edition of just 150 unframed pieces, the Star Wars Ghost in the Wind Paper Giclee Art Print measures 22-inches wide x 17-inches tall and comes with a certificate of authenticity. The image itself measures 21-inches wide x 10 1/2-inches tall.